Cabbage Soup is one of our favorite recipes all year long! It’s vibrant, healthy and totally delicious. This easy cabbage soup recipe has loads of fresh vegetables and of course cabbage all simmered in a delicious broth! 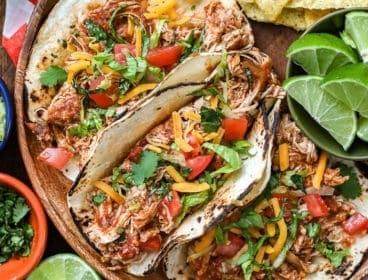 With just a few minutes of preparation, your slow cooker does all of the work making this the perfect meal to enjoy all week long! 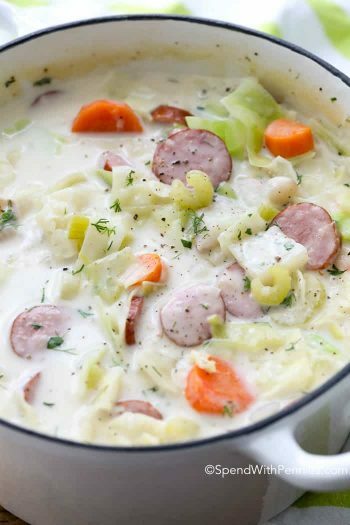 Cabbage just seems to be the perfect addition to soups from rich and tomatoey (like Cabbage Roll Soup Recipe) to velvety Creamy Sausage & Cabbage Soup. 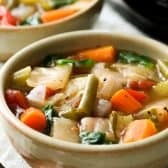 I make a batch of Weight Loss Vegetable Soup almost every week. I enjoy it for lunches and sometimes have a small bowl in the afternoon as a snack or before dinner to fill me up with something healthy! I find eating a nice hearty bowl of cabbage soup before a meal not only helps me get more veggies into my diet, but also to keep my calories in check for the rest of the meal. 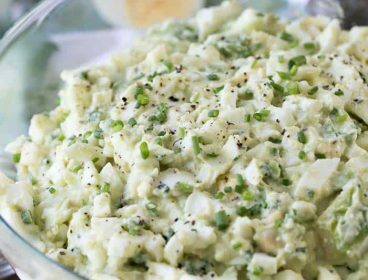 Cabbage is one of my all time favorite vegetables! This easy cabbage soup recipes takes just minutes to put together and then lets your crock pot do all of the work! 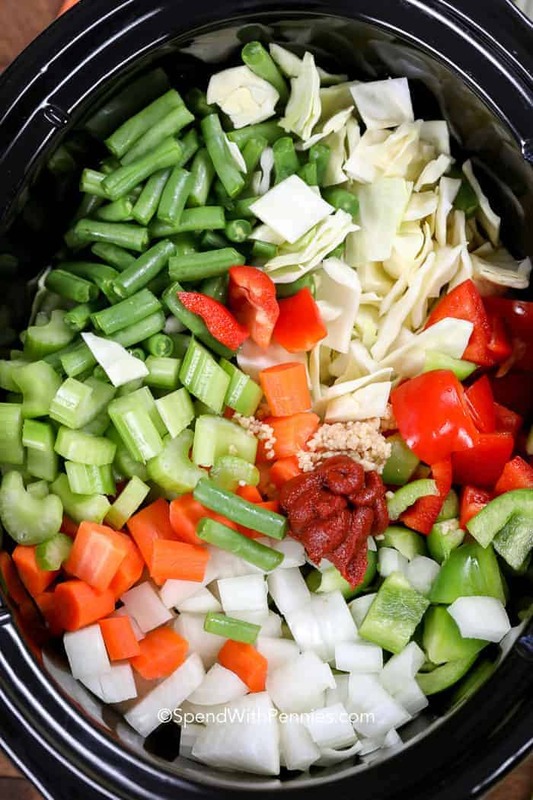 How Do You Make Cabbage Soup in a Crock Pot? As easy as my original cabbage soup recipe is, I have been asked countless times how to make cabbage soup in the crock pot. 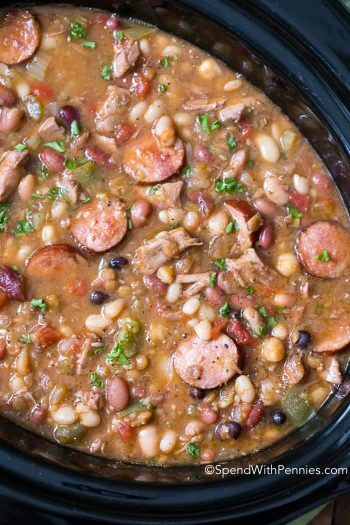 I wanted a recipe that could not only be effortlessly simmered in my slow cooker, but that would also have flavors that lend itself well to several additions. 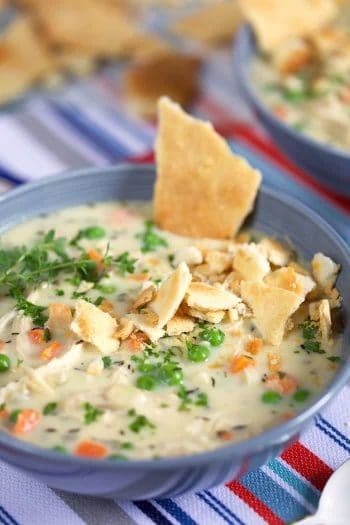 The base flavor of this soup is perfect to eat on its own or to add in your favorite lean protein (like chicken) and healthy carbohydrates (like brown rice) to create new soups to enjoy all week. It can be easily tailored to your own likes or to use up whatever vegetables you may have on hand. What goes in Cabbage Soup? 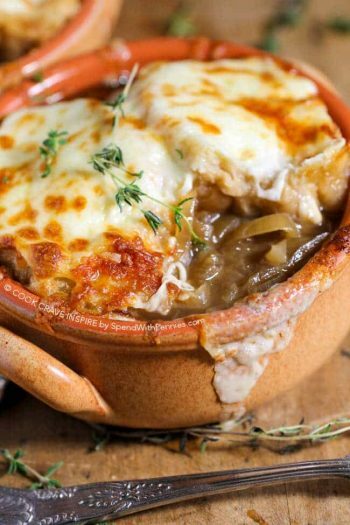 There are many cabbage soup recipes and several versions of the cabbage soup diet recipe. They all contain a combination of vegetables and sometimes vegetable juice or even packaged onion soup mix. 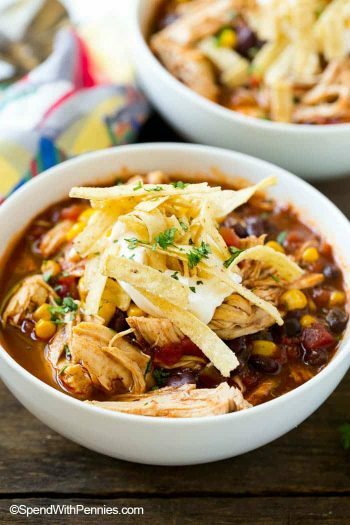 I prefer to use a combination of ingredients that are low sodium and low sugar to create healthier version, make it Weight Watchers friendly (zero points) and keep the calories under 50 calories per cup. While you can use your favorite combinations, there are a few essentials you’ll need to make this slow cooker soup recipe; cabbage, vegetables, broth and seasonings/spices. Of course you’ll need fresh cabbage to start with (you can find info about choosing the right varieties of cabbage here). For this recipe I use fresh vegetables washed, sliced and added directly to the slow cooker (no need to pre-cook). The vegetables added to this cabbage soup were selected for the ability to stand up to the slow cooker without getting mushy plus they all reheat well. If you’d like to add in extra (or different) vegetables, be sure to keep cook/reheat times in mind. For example zucchini and broccoli both cook quite quickly and should be added in the last hour of cooking so they don’t get mushy. I prefer a chicken broth (or homemade chicken stock if possible) but if you’d like to keep this vegetarian, a vegetable broth will work too. Using low sodium broth and low sodium canned tomatoes will help keep the salt levels in check for this recipe. What Spices Go Well With Cabbage Soup? This soup uses aromatics such as onions and garlic to flavor the broth. A bit of tomato paste adds some richness and finally I add Italian Seasoning. Italian seasoning can be found in the spice aisle and it’s a combination of basil, oregano, rosemary and a few other spices. It’s versatile and adds great flavor to this soup. Feel free to add your favorites like Homemade Taco Seasoning or a few dashes of hot sauce. Finally, just before serving, we add fresh herbs including parsley and basil. Fresh herbs are best added at the end of cooking as this keeps the flavors fresh. How Long Does it Take to Cook Cabbage Soup? We cook this recipe on the weekends and eat it throughout the week for dinners and lunches. This easy cabbage soup is quick to prepare and then the slow cooker does all of the work. In the Crock Pot, this cabbage soup takes about 8 hours on low or 4-5 hours on high. If you’d like to make this a little bit faster you can cook it on the stove top for about 25 minutes or until all of the vegetables are tender. To freeze it, I portion it into individual servings in freezer bags. To defrost, I place a bag in the fridge the night before and by lunch the next day it’s ready to warm up in just a couple of minutes. The best thing about this soup is that it’s delicious as a base to create meals all week long. 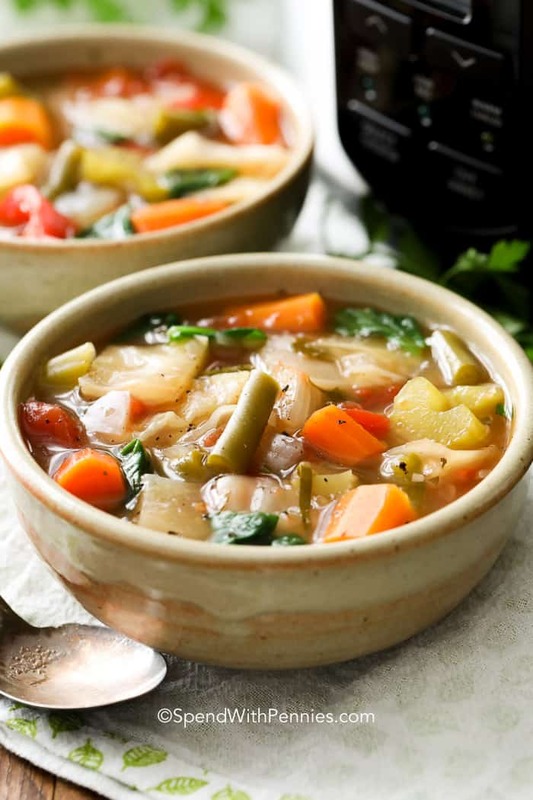 While we enjoy it as a perfect vegetable soup but we also add in our favorites to create new soups for meals throughout the week. 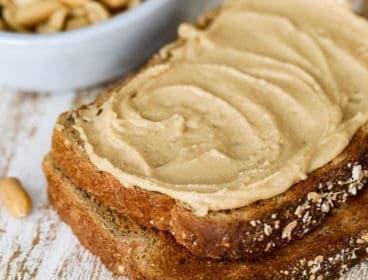 Adding lean protein along with some healthy carbohydrates can transform this recipe into delicious new flavor combinations to enjoy all week long! The vegetables and seasonings in this soup are versatile and will pair well with many additions. Chicken Rice Soup: Cooked ground chicken (or chicken breast) and brown or wild rice. Quinoa Vegetable Soup: Cooked quinoa with a sprinkle of parmesan cheese. Italian Bean Soup: Rinsed canned cannellini beans (white kidney beans), fresh basil and a dash of parmesan cheese. Skinny Beef Vegetable Soup: Cooked extra lean ground beef and diced sweet potato. Seafood Soup: Salmon, shrimp & parsley. (Put into the soup raw and cook 7-10 minutes). Vegetable Minestrone: Kidney beans, whole wheat macaroni noodles, fresh basil. The possibilities to create new flavors with this recipe are endless! Let us know what YOUR FAVORITE additions are! Cabbage Soup is one of our favorite recipes all year long! It’s vibrant, healthy and totally delicious. Is Cabbage Soup Good For Burning Fat? This soup is perfect on it’s own enjoyed as a vegetable soup. It’s naturally low in calories and fat and high in fiber. While people often think of cabbage as a fat burning food, no food can actually burn fat. 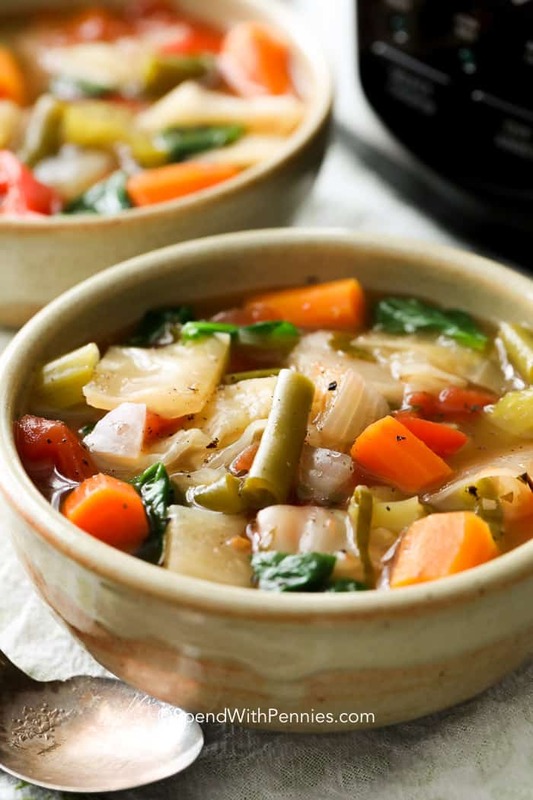 We’ve all heard of the cabbage soup diet which, according to WebMD, is a short-term weight loss method that will help you lose up to 10 pounds in 7 days. What Can You Eat on the Cabbage Soup Diet? Basically, for 7 days you eat a version of, you guessed it, cabbage soup. 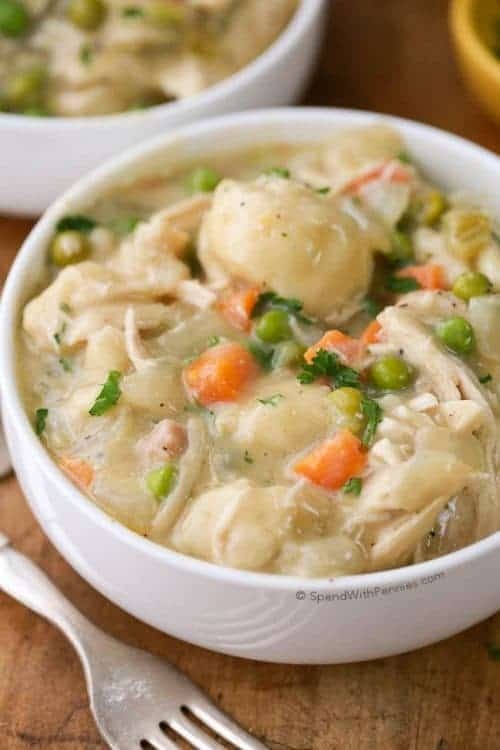 Along with soup, the cabbage soup diet meal plan includes small portions of fruits and nutrient-dense veggies, rice, meats (chicken, fish, or beef), potatoes, fruit juice, and milk. As most of us know, according to ChooseMyPlate.gov, a healthy diet includes a variety of fruits, vegetables, proteins, dairy and healthy grains! Cabbage is a vegetable and it’s good for you, loaded with vitamins, low calorie (and delicious). We add cabbage to soups, coleslaws and casseroles. It can be incorporated into most weight loss programs or into a regular healthy diet! I would like recipes daily please. Just trying for the first time today. I cant have corned beef on st patricks day but I can have cabbage. I do have a question, the canned goods you used. Were they low sodium or no salt added? And if the low sodium hope much was in the can/serving? Just wanted to know to compair amounts. Hi Adam, I try to use reduced sodium options when I can. I hope you enjoy the cabbage soup! Happy St. Patrick’s Day! I absolutely can’t stand the texture of celery, raw or cooked. Can I substitute celery seed, and if so, how much? While I have only made the recipe as written, I think you could make this substitution with success Laura. I would use a small amount of celery seed, maybe 1/2 a teaspoon. If adding lean ground beef should I cook the beef before or add it uncooked? The beef should be cooked and drained. Enjoy the soup Richard! Would be perfect for a cold winter day. 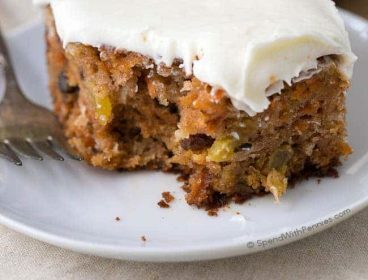 Definitely a belly warming recipe! How high heat should I do for stovetop? You can find stove top Cabbage Roll Soup here. approximately how many people does this feed? This recipe makes about 14 cups (it can vary a bit based on the size of your veggies). Sounds good and I would reduced ingredients to make less but would it be possible to use frozen chopped cabbage and vegetables? Possibly have to cook on top of cooker instead of SC as these would cook quicker. I’m sure that would work just fine Wendy. For stove top cabbage soups, you may also be interested in myCabbage Roll Soup recipe and my Creamy Sausage & Cabbage Soup. 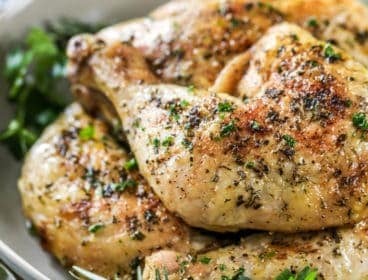 Good post and great recipe. I would add that ChooseMyPlate recomends any protein, plant-based being much healthier than animal-based protein, as it contains none of the saturated fat, insulin-like growth factors, antibiotics, or heart disease producing trimethylamine (TMA) compounds found in meat, and “dairy” can include soy, almond, hazelnut, or any of the plant-based substitutes, with the added benefit that these choices contain no mammalian hormones, antibiotics, or saturated fat (2% cow’s milk is actually 37% saturated fat by calories). Thanks again for the great recipe! with any other ingredients or just leave the tomato product out. You can leave out the diced tomatoes and tomato paste, and of course it will change the taste somewhat (but you’ll be able to eat it though :)). You may want to substitute some chicken base to add a little extra flavor in lieu of the tomato paste. Enjoy Judy! I would like to try this with wild rice. How much should I put in? I’d suggest approximately 1 1/2 cups, Maria. Adjust to suit your taste! Nice basic recipe! Easy to make variations. Good for cleaning out the refrigerator of miscellaneous veggies as well. I have a 2.5 gallon All-Clad slow cooker so I made use of the extra volume by adding more veggies, stew beef cubes, a cup of dried barley, fresh herbs in cloth bag, and more of my own bone broth. I also used a 28 ounce can of organic fire roasted diced tomatoes, nice flavor with no extra cost. I make and sell bone broth to friends and I had a number of left over jars made from different bones; Chicken, turkey, beef, it all mixed very nicely to my surprise. I can’t estimate how much it cost me because of the expense of making my own bone broth but I have 14 pint jars heading to the freezer! Oh, beef cubes would be better, maybe, if I have browned them before adding. Next time I will omit any meet as my bone broth has plenty of protein. Those sound like some excellent additions Susan. It’s a versatile recipe. Glad you love it! AM CURIOUS AS TO THE FLAVOR OF THIS SOUP. 2 BAY LEAVES, 1 1/2 TSP ITALIAN SEASONING AND 1 T. BASIL SOUNDS LIKE A LOT OF SEASONING FOR THE AMOUNT OF LIQUID IN THIS RECIPE! I’M SURE IT DOSEN’T EVEN AMOUNT TO 7 CUPS. ENLIGHTEN ME. The seasoning is perfect. This makes about 12 cups of soup, keep in mind the vegetables will release liquid as well. Yum! This sounds so good. The perfect hearty winter soup for January! Thanks Kate!! We love this one! This looks extremely yummy. What is the serving size and how many calories are in this? The serving size is 1 cup and this is approximately 41 calories. Happy new year! I am so glad you found the recipe again! Are additions like cannellinni beans added before cooking or after? Since they are canned and soft, we add them to individual servings and before reheating. I make my own version of my favorite soup and call it vegetable soup and it’s almost identical to this. I put my favorite veggies with beef and a bone, prime rib or rump, and add a turnip, and use same veggies as yours, lots of carrots, tomatoes, and cabbage. I also make it about once a week and start meals with it a few days. Major difference, I use a stovetop pressure cooker 20 minutes. It’s delicious. 20 minutes to soup?! That sounds perfect Lynne! 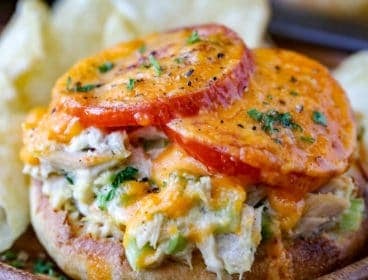 I would love to try your recipe out! That will depend on what broth you use.